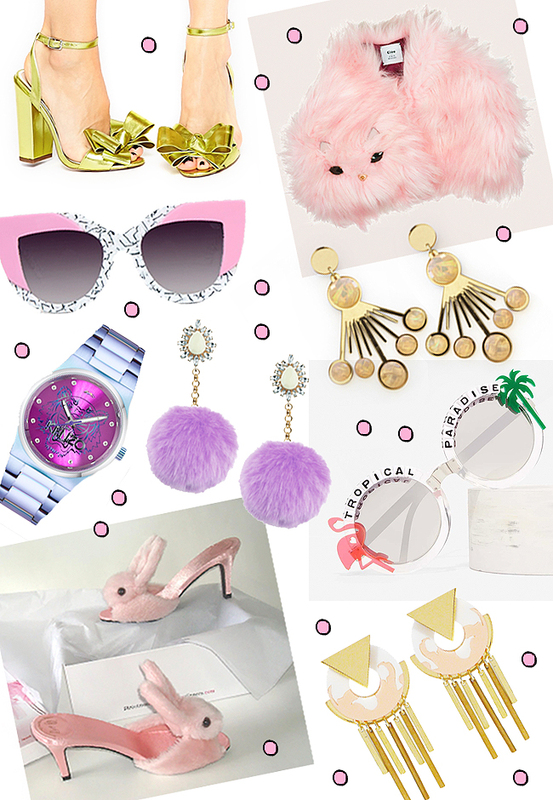 Just as the Easter bunny brings colourful eggs, I like you to start this wonderful weekend with my lovely fashion finds article and picked only the best. Of course, I couldn‘t resist to include a bunny item: The heeled slippers from Streetzie‘s have a rarely seen wow-factor, I couldn‘t stop thinking of them since spotting them on pictures of last London fashion week on the feet of the models for Clio Peppiatt (see here at Fashionista Barbie). I always had a big love for accessories, but at the moment, they excite me even more than usual. When I study the look of people on the street, I am surprised how many don‘t wear accessories at all, or only very little and few pieces. I say that they need to be bold, fun and big. I might own more necklaces than T-shirts, but I can‘t imagine the other way around. Play girls and don‘t be too shy to have fun! So please dear Easter bunny: No sweets this year, but why don‘t you bring earrings instead of chocolate eggs? My health and my addiction for fashion will thank you very much. Have a happy weekend! store with branded accessories or accessories by world's most famous designer like London & Co.It is the best online store for buying garments,accessories,jewels and leather made products of supreme quality by world's most exciting emerging designers.